Your company's Oracle databases are an integral component of business critical applications like customer relationship management, enterprise resource planning, supply chain management, financial record and asset management etc. It is crucial to the ongoing and future needs of your corporation. IBackup backs up your running databases with no downtime - ensuring business continuity in the face of a data disaster. The IBackup application enables you to backup Oracle server databases (Oracle 9i/10g) to your IBackup account in a secure and reliable manner. Using the application, you can back up the databases without interrupting the running Oracle server database services. View the features and the procedure to backup the Oracle server databases. 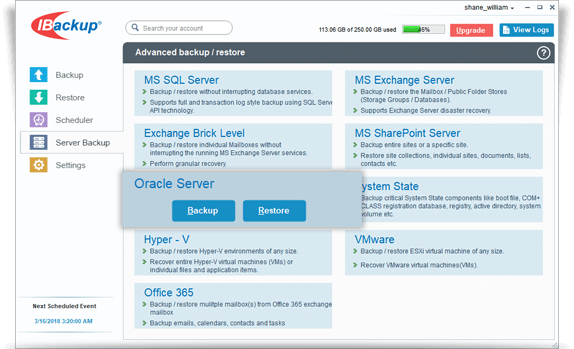 The IBackup application ensures a secure, easy and quick restore of the Oracle server databases (Oracle 9i/10g). View details on the features and the procedure to restore the Oracle server databases.